The anterior portion of the nasal septum is composed of a thin cartilaginous plate with a closely adherent perichondrium and mucosa. 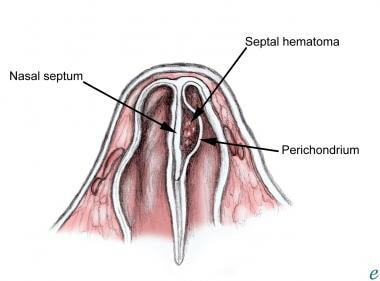 Submucosal blood vessels are torn as buckling forces pull the perichondrium from the cartilage. 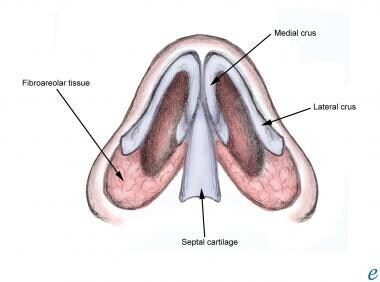 Subsequently, blood may collect between the perichondrium and the septal cartilage. Bacterial proliferation and abscess formation may then result from the presence of stagnant blood. A hematoma may become infected within 3 days of the trauma. See images below. The nasal septum derives its blood supply from the sphenopalatine and the anterior and posterior ethmoid arteries with the added contribution of the superior labial artery (anteriorly) and the greater palatine artery (posteriorly). The Kiesselbach plexus, or the Little area, represents a region in the anteroinferior third of the nasal septum, where all 3 of the chief blood supplies to the internal nose converge. For more information about the relevant anatomy, see Nasal Anatomy. The nasal septum is normally 2-4 mm thick. If the cartilage is fractured, blood can dissect through the fracture line and form bilateral hematomas; therefore, both sides should be examined. According to a study by Canty et al, the most common symptoms noted in children were nasal obstruction (95%), pain (50%), rhinorrhea (25%), and fever (25%). Symptoms usually appear within the first 24-72 hours. Nasal septal hematoma in adults typically occurs with significant facial trauma and nasal fracture. However, in children, nasal septal hematoma may be found with minor nasal trauma such as simple falls, collisions with stationary objects, or minor altercations with siblings. [5, 6, 7] Additionally, the presence of nasal septal hematoma with or without concomitant injuries should raise suspicion for child abuse, especially in infants and toddlers. A septal hematoma can usually be diagnosed by inspecting the septum with a nasal speculum or an otoscope. Asymmetry of the septum with a bluish or reddish fluctuance may suggest a hematoma. Direct palpation may also be necessary, as newly formed hematomas may not be ecchymotic. The best way to palpate is to insert a gloved small finger into the patient’s nose and palpate along the entire septum, feeling for swelling, fluctuance, or widening of the septum. Blood clots should be suctioned to allow better visualization. No absolute contraindications exist to nasal septal hematoma drainage. Topical lidocaine or Pontocaine or injectable lidocaine without epinephrine can be used, not to exceed a dose of 5 mg/kg or a total of 300 mg.
For more information, see the Clinical Procedures topic Topical Anesthesia. The patient is best positioned supine with some elevation of the head of the bed to allow drainage of blood out of the nose. If a septal abscess is suspected, needle aspiration under topical anesthesia can be performed using an 18- to 20-ga needle. Except in patients who present immediately after hematoma formation, specimens should be sent for gram stain and aerobic and anaerobic cultures. Systemic antibiotics should then be administered. To drain the hematoma, incise the mucosa over the area of greatest fluctuance without incising cartilage. Bilateral staggered incisions should be made for bilateral hematomas to avoid a through-and-through perforation. See image below. Incision of nasal septal hematoma. Suction out the clot; then irrigate with sterile normal saline. 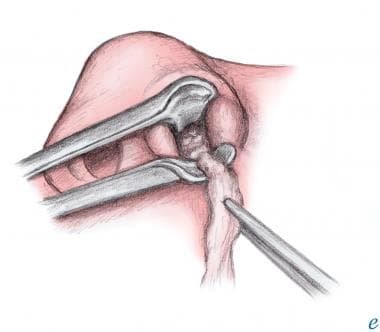 A small section of the mucoperichondrium should be excised to prevent premature closure of the incision. See image below. Excision of mucoperichondrium with ring forceps. Place a small Penrose drain and suture it in place. See image below. Broad spectrum antibiotics should be administered. If infection is suspected, the patient should be admitted for parenteral antibiotics. The patient should follow up with an otolaryngologist without delay. Children should also be evaluated periodically for 12-18 months to avoid cosmetic deformities. Prophylactic treatment with an antibiotic is recommended to cover Streptococcus pneumoniae and beta-lactamase–producing organisms. Although no clear consensus exists on the choice of antibiotic or duration of treatment, most case reports have used amoxicillin/clavulanate (Augmentin). If an abscess is suspected, clindamycin is recommended as initial therapy until culture results are available. Septal hematomas should be drained as soon as possible to prevent long-term complications. Prophylactic broad-spectrum antibiotics should be administered to cover Staphylococcus aureus, Haemophilus influenzae, and S pneumoniae. Close follow-up with an otolaryngologist must be arranged to avoid potentially delayed complications. Children should follow-up periodically for 12-18 months after initial treatment. An expanding hematoma can cause pressure-induced avascular necrosis of the cartilage. Collapse of the nasal septum and loss of dorsal support can lead to depression of the nasal bridge and a subsequent saddle-nose deformity. Early drainage of the hematoma improves blood flow to the septal cartilage but may not reverse antecedent cartilage destruction. 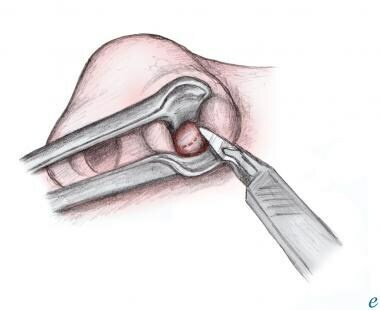 Therefore, the clinician must have a high index of suspicion of a nasal septal hematoma after any nasal trauma in order to initiate proper early surgical treatment. Matsuba HM, Thawley SE. Nasal septal abscess: unusual causes, complications, treatment, and sequelae. Ann Plast Surg. 1986 Feb. 16(2):161-6. [Medline]. Ambrus PS, Eavey RD, Baker AS, et al. Management of nasal septal abscess. Laryngoscope. 1981 Apr. 91(4):575-82. [Medline]. Junnila J. Swollen masses in the nose. Am Fam Physician. 2006 May 1. 73(9):1617-8. [Medline]. Canty PA, Berkowitz RG. Hematoma and abscess of the nasal septum in children. Arch Otolaryngol Head Neck Surg. 1996 Dec. 122(12):1373-6. [Medline]. Toback S. Nasal septal hematoma in an 11-month-old infant: a case report and review of the literature. Pediatr Emerg Care. 2003 Aug. 19(4):265-7. [Medline]. Alshaikh N, Lo S. Nasal septal abscess in children: from diagnosis to management and prevention. Int J Pediatr Otorhinolaryngol. 2011 Jun. 75(6):737-44. [Medline]. Sayn I, Yazc ZM, Bozkurt E, Kayhan FT. Nasal septal hematoma and abscess in children. J Craniofac Surg. 2011 Nov. 22(6):e17-9. [Medline]. Chukuezi AB. Nasal septal haematoma in Nigeria. J Laryngol Otol. 1992 May. 106(5):396-8. [Medline]. Kim YS, Kim YH, Kim NH, Kim SH, Kim KR, Kim KS. A prospective, randomized, single-blinded controlled trial on biodegradable synthetic polyurethane foam as a packing material after septoplasty. Am J Rhinol Allergy. 2011 Mar-Apr. 25(2):e77-9. [Medline]. 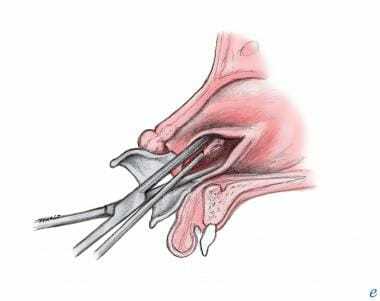 Naghibzadeh B, Peyvandi AA, Naghibzadeh G. Does post septoplasty nasal packing reduce complications?. Acta Med Iran. 2011. 49(1):9-12. [Medline]. Günaydin RÖ, Aygenc E, Karakullukcu S, Fidan F, Celikkanat S. Nasal packing and transseptal suturing techniques: surgical and anaesthetic perspectives. Eur Arch Otorhinolaryngol. 2011 Aug. 268(8):1151-6. [Medline]. Agrawal N, Brayley N. Audit of nasal fracture management in accident and emergency in a district general hospital. J Eval Clin Pract. 2007 Apr. 13(2):295-7. [Medline]. Menger DJ, Tabink I, Nolst Trenité GJ. Treatment of septal hematomas and abscesses in children. Facial Plast Surg. 2007 Nov. 23(4):239-43. [Medline]. Ginsburg CM, Leach JL. Infected nasal septal hematoma. Pediatr Infect Dis J. 1995 Nov. 14(11):1012-3. [Medline]. Huang PH, Chiang YC, Yang TH, Chao PZ, Lee FP. Nasal septal abscess. Otolaryngol Head Neck Surg. 2006 Aug. 135(2):335-6. [Medline]. Savage RR, Valvich C. Hematoma of the nasal septum. Pediatr Rev. 2006 Dec. 27(12):478-9. [Medline]. The authors and editors of Medscape Reference gratefully acknowledge the assistance of Lars Grimm with the literature review and referencing for this article. Fast Five Quiz: Do You Know Best Practices for Antibiotic Use in Respiratory Tract Infections? Fast Five Quiz: Do You Know the Manifestations of and Best Treatment Practices for Streptococcal Infections? How Strong is the Case for Unrestricted Clear Fluids in Day Cases?